child by name. While you might think this would bring pain to the family, there is more pain when it appears the child has been forgotten. the child died. Tasks which were routinely completed in the past may now go undone. such as shopping and preparing meals. Bring some holiday goodies. favorite charity that the family may find important in their lives. similar loss and are ready to help families that are grieving. holiday music blaring can be overwhelming to bereaved parents. church. Your presence will show that you truly care. others who care deeply about them and will truly be there to provide support along the way. The Compassionate Friends has nearly 600 chapters serving all 50 of the United States plus Washington D.C. and Puerto Rico and offers friendship, understanding, and hope to bereaved families following the death of a child. The organization has a presence in an estimated 29 countries around the world. For more information on a local chapter, call The Compassionate Friends toll-free at 877-969-0010 or visit The Compassionate Friends national website at www.compassionatefriends.org. Oak Brook, IL (November 20, 2007)—With the normally festive holidays upon us, millions of families throughout the United States that have lost a child are struggling with how they can simply survive to see the new year. 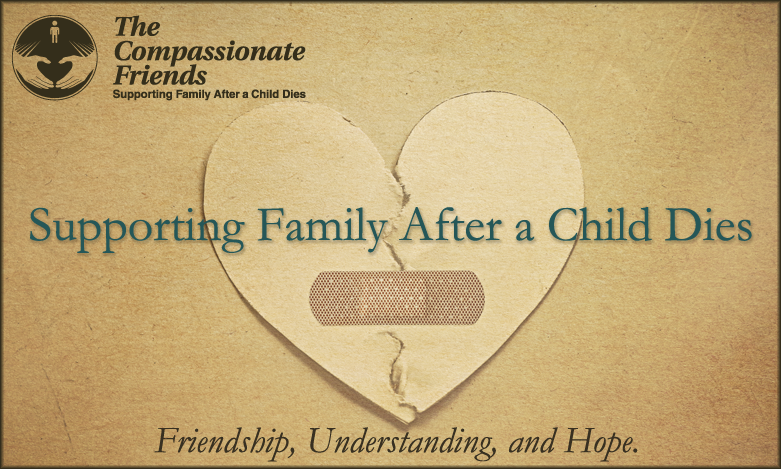 “It is difficult for those who have not been touched by the death of a child to understand the depth of despair which such a loss brings to a family,” says Patricia Loder, executive director of The Compassionate Friends. “The stress of the holidays for bereaved parents, siblings, and grandparents can feel over whelming. The Compassionate Friends, with more than 600 U.S. chapters and locations in every state, as well as Washington, DC and Puerto Rico, is a mutual assistance self-help organization for bereaved parents and families where more seasoned grievers help support the more newly bereaved .Mrs. Loder, whose two young children died in a car crash in 1991, says there are many tips that can help a grieving family prepare for the holidays. 1) Plan ahead. Realize you will not be able to do everything with everyone. Decide what is truly important to you and your family. 2) Don’t be afraid to ask friends for help. Tasks which may normally take little effort can feel overwhelming, whether it’s fixing a meal, cleaning the house, or putting up decorations. 3) No one expects you to string rows and rows of lights just to prove you have the holiday spirit. If you don’t feel up to past efforts, you may simply want to place an electric powered candle in your window in memory of your child. 4) Just because you’ve hosted holiday gatherings in the past doesn’t mean you’re obligated to this year. Others will understand. 5) After a child dies, old traditions are often left behind and new ones that incorporate the child who died can take their place. Honor the memory of your child in unique ways that have meaning to you. 6) Surviving children should be included in your plans. They, too, mourn their sibling, but need a normalcy the holidays can provide. 7) If you don’t get everything done you plan, be easy on yourself. Grief is tough work and you should never feel guilty for not completing every task. 8) If you must shop for others, find a time when the stores are not extremely busy like early morning, order through the Internet or ask others to shop for you. 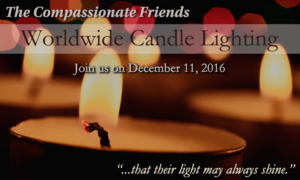 9) Participating in a memorial service, such as The Compassionate Friends Worldwide Candle Lighting the second Sunday in December, this year December 9, can be very meaningful. This can be done in a formal service with others or through a short private candle lighting in the privacy of your home. 10) Remember that the fearful anticipation of an approaching holiday is usually worse than the day itself. “There is no way to run away from your grief during the holidays,” says Mrs. Loder. “Even if you escape on a vacation, your pain will be carried with you, and you will have left behind the support of relatives and friends. Talking with others who have also experienced the death of a child can help those facing grief to understand they are not alone. Others have survived the holidays and you will, too. ”The Compassionate Friends has a presence in an estimated 29 countries around the world. call toll-free 877-969-0010 or visit The Compassionate Friends national website at www.compassionatefriends.org.